For most residents of Istanbul, Balat is a special neighborhood. We recommend visitors to go and take a walk there. Once or twice a year we find ourselves roaming its streets. Balat has a long and interesting history that many Istanbul citizens don't know much about. Jewish immigrants, escaping from the Spanish Inquisition, came to Balat in the late 15th century, after Ottoman Sultan Bayezid II offered them protection. Once they started living in the neighborhood, Jewish people started transforming the place, applying their sense of aesthetic and architecture to buildings around them. Today most tourists visit the neighborhood for its synagogues, old houses, the Ayios Strati Orthodox Church and the Ferruh Kethüda Mosque built by Mimar Sinan in mid-16th century. When Silva Bingaz, a Malatya-born, self-educated photographer decided to photograph Balat, she felt compelled to take an unorthodox approach. Bingaz's photography exhibition "Balat," on display at Öktem & Aykut Gallery in Galata until June 20, shows the neighborhood under an uncanny, sinister new light. This is not the touristic neighborhood we have become accustomed to associate with its touristic landmarks. In Bingaz's perspective, Balat is living in the present tense, with real people living there. And those people seem quite concerned about the future of both their lives and their neighborhood. "I can take pictures wherever I go," Bingaz told me. "I was commissioned to work in Japan and found that I could do it there. I can work anywhere. When my friends at the Turkish magazine Doxa asked me if I would be interested in taking pictures of an Istanbul neighborhood, I found it to be a 'derive' experience. This project was an unplanned journey where I, in the role of the photographer, got lost. I had just met this young person, this musician, living in Balat. So I decided to go to Balat and photograph the neighborhood. I had no plans when I went there." Prior to Balat, Bingaz had worked in Yeşilköy, Marseille and Tottori for photography-related projects. Her career as a photographer began in 2001 and she has since "approached multilayered micro-geographies laden with history and recorded ephemeral and precarious life-stories at marginal regions," according to Tankut Aykut and Doğa Öktem, the curators of the exhibition and the co-directors of the gallery. "A historically central district, Balat today is just another part of Istanbul where the century-old residents are being replaced by a new cosmopolitan crowd and where the ancient historical elements can only be revealed by an attentive touch. The portrait works that compose the majority of the exhibition both capture its subjects' spontaneity while they are unaware of being photographed and record them during moments of self-surrender. The visitors witness how Balat is ever building-up its new identities, after losing numerous old ones, through Bingaz's camera's odd relationship with its subjects." Bingaz believes that every city, country and neighborhood has its own character. "I discover that character while searching for the common spirit of people that live in that neighborhood," she explained. Bingaz calls this process of finding similarities "an excavation work." "What made Balat different was this uncanny feeling that I experienced there. I had felt the same thing while working in Istanbul in 2012 when I wanted to take a new look at the city. In Balat I was anxious in the beginning. I feared about not getting accepted into the neighborhood. I felt different from people living there and I had to take risks." "Bingaz's first work was a story of an Iraqi immigrant woman named Beyan and Bingaz worked with her three years starting from 2001," Aykut and Öktem explain. "At the same period in 2002, she started working on her ongoing project titled Coast... She took part in EU Women, a project presented in 2007 in Lodz, Paris, Sevilla and New York. In 2010 she was invited to the Japanese city Tottori as one of the photographers under the exchange program European Eyes on Japan. In 2012, her series Insider was commissioned by Espace Culturel Louise Vuitton and exhibited under Journeys: Wanderings in Contemporary Turkey." For such an international figure, working in Balat turned out to be quite a difficult experience. If you happen to visit the neighborhood nowadays you will probably see lonesome figures, foreign and local tourists, taking pictures of Balat residents as if they belong to different worlds. This irritated Bingaz. "None of those people visit Balat at night," she told me. "They rarely attempt to get inside those houses. Balat has many different faces and those faces change during the day... 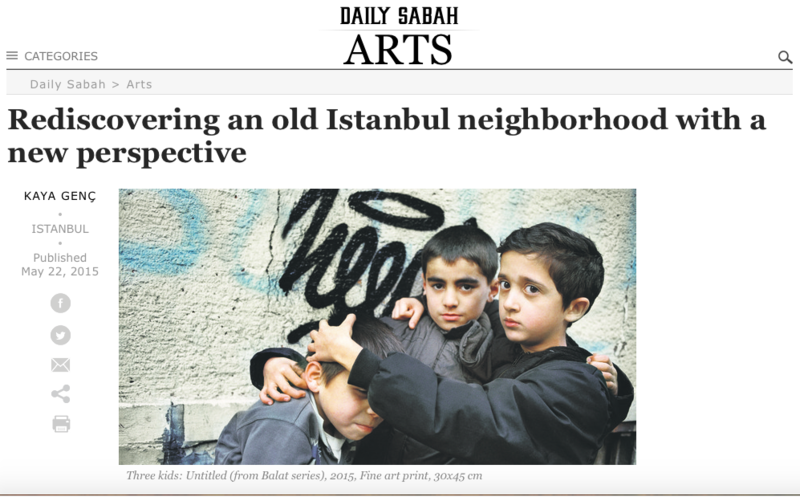 It is not possible to show Balat through a nostalgic perspective which has nothing to do with the neighborhood's present state." One of Bingaz's photographs shows a group of CCTV cameras overlooking Balat. It is a scary image since those cameras bring to mind the panopticon, a construction that allows a watchman to observe all the residents of a place without them being able to tell if they are watched. "There was a sense of auto-control in Balat," Bengaz said. "I saw thick walls covered by barbed wire. Those walls sadly represent the old buildings of Balat in their last breath. They are the last remnants of Christian and Jewish citizens who stopped living there." "I tried to take pictures of people who looked more like me and kept my distance if I sensed a big cultural or social gap between us. I respect people's personal spaces and privacy. If someone is irritated with a photographer I totally respect that." Among the numerous portraits in the exhibition Bengaz's self-portrait catches the eye. "Balat is open to ancient cultures but for some women living there it plays the role of a prison. Therefore I didn't have much chance to take pictures of women. So, as a woman, I decided to take a picture of myself," Bingaz said.